Is ‘Buster the Boxer’ John Lewis’ most emotionally engaging festive ad? 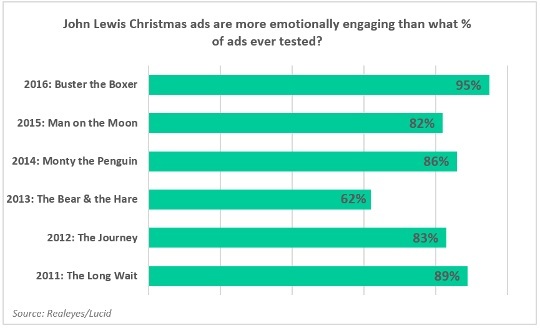 John Lewis’ “Buster the Boxer” ad is more emotionally engaging than the previous five editions and all other ads from the retailer, according to new research. The results, from ad tech firm RealEyes, are based on facial recognition technology which measured people’s reactions as they watched the ads. It’s the most compelling of the last six John Lewis ads (see chart below), the next best being 2011’s “The Long Wait” which scored better than 89% of ads ever measured. The scene of Buster on the trampoline is the most engaging scene ever tested for a John Lewis ad. Emotion measurement firm Realeyes measured the reactions of 1,700 people across 49 key facial points as they watched the ads via their webcam. The respondents were sourced by audience platform Lucid.